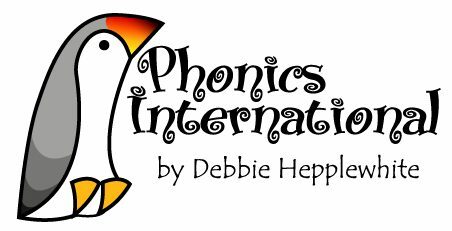 You can hear Debbie say each 'sound' shown down the left-hand column of the Alphabetic Code Chart followed by an example word which includes the sound. This is the first sound of the words at first, but can also be the middle or last sound of the example words. Most of the sounds are 'phonemes' (the smallest identifiable sounds) such as /s/ and /i/ but some sounds are two phonemes combined such as /k+s/ as in 'fox' and /k+w/ as in 'queen'. The focus graphemes (letters or letter groups) are highlighted in the printed words and pictures illustrate the meaning of the words. Debbie uses the same Alphabetic Code Chart but this time she says each sound followed by the word examples for all the 'spelling alternatives' (graphemes) as shown across the rows on the chart. 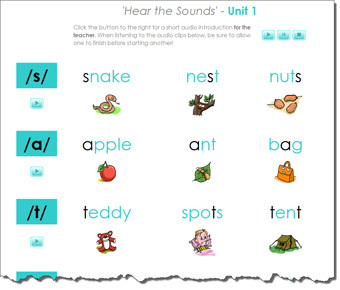 The spelling alternatives on the Alphabetic Code Chart (as shown on the videos) have a full range of teaching and learning resources in the Phonics International programme to teach the alphabetic code and the three core skills of blending all-through-the-word for reading, segmenting all-through-the-spoken-word for spelling and handwriting. Ultimately, learners need to become familiar with 'spelling word banks' to support them with life-long spelling.